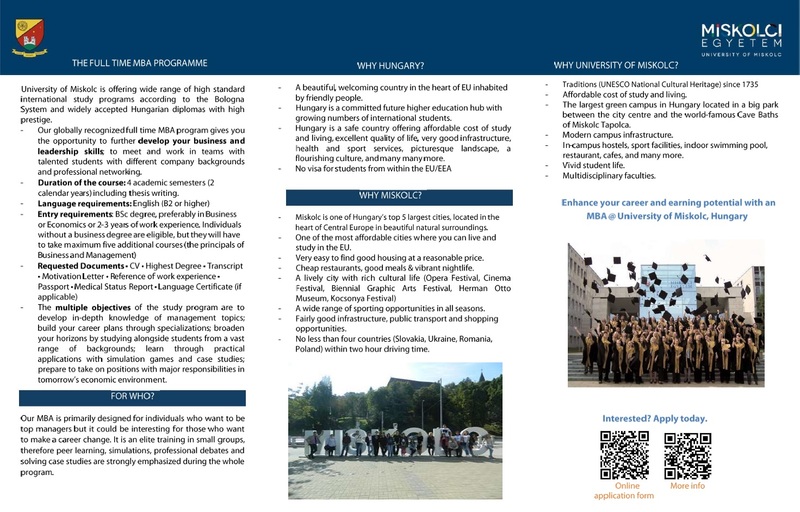 The multiple objectives for graduates of the MBA programme are to develop in-depth knowledge of management topics, build your career plans through specializations, broaden horizons by studying alongside students from a vast range of backgrounds, learn through practical applications with case studies, and prepare to take on high-paying jobs with major responsibilities in tomorrow's demanding economic environment. Credit acceptance: Applicants shall preferably hold a BA/BSc or MSc degree in Economics, Commerce, Marketing, Management, International Business, Finance, Accounting or Tourism. Students with other BA/BSc or Master degrees can also apply if they have collected 60 credits in the subject areas as listed below. Applicants with a minimum of 30 credits will also be considered, however, they will need to obtain a further max. 30 credits during the first academic year of studies as designated by the Program Director. 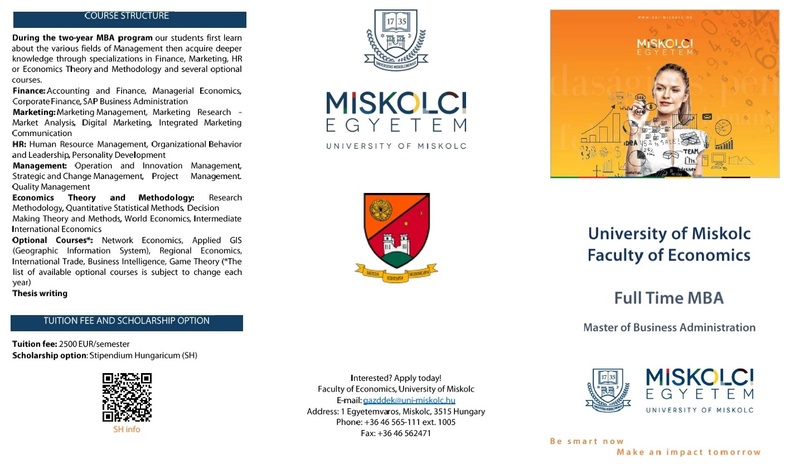 Foundation courses in Methodology (15 credits): Mathematics, Statistics, Informatics o Foundation courses in Economics (10 credits): Microeconomics, Macroeconomics, International Economics, Environmental Economics, Economic Theory, Economic Statistics, Economic Modelling, Economic Policy, Sectoral and Functional Economy, Public Economics, World and European Economics, Public Policy Skills o Foundation Courses in Business (10 credits): Business Economics, Finance, Business Law, Decision Theory and Methodology, Business Ethics, Business Communication o Foundation courses in Social Sciences (10 credits): EU Studies, Economic and Legal Studies, Economic History, Sociology, Philosophy, Psychology o Professional Knowledge (15 credits): Organizational Behaviour, Accounting, Corporate Finance, Marketing, Production Management, Management and Organization, Controlling, Strategic Planning, Human Resource Management More information on the credit acceptance procedure • The unconditional prerequisite for applying to a Master’s program is the applicant’s having obtained at least a Bachelor level diploma (min. 3 years of studies!). • In cases, where the obtained diploma is not in the required study area as set out in the admission requirements, applicants must hand in the present Request for Credit Acceptance form together with the appropriate Course Form. • In the course of the credit acceptance process, the Credit Acceptance Committee of the Faculty of Business Administration will determine how many credits can be accepted from the applicant’s previous higher educational studies in the given Master’s program. Missing credits can be achieved after acceptance within the first two academic semesters, by registering for the courses prescribed by the Credit Accreditation Committee. The applicants must submit the following documents: • A Request for Credit Acceptance form • The Course Form • A copy of the previous transcript or index and the diploma supplement. Language requirements: English - a min. B2 (upper-intermediate) knowledge equivalent to IELTS 5.5-6.5, TOEFL 87-109 or Cambridge FCE (B2 or higher) is required, advanced (C1) level is recommended.